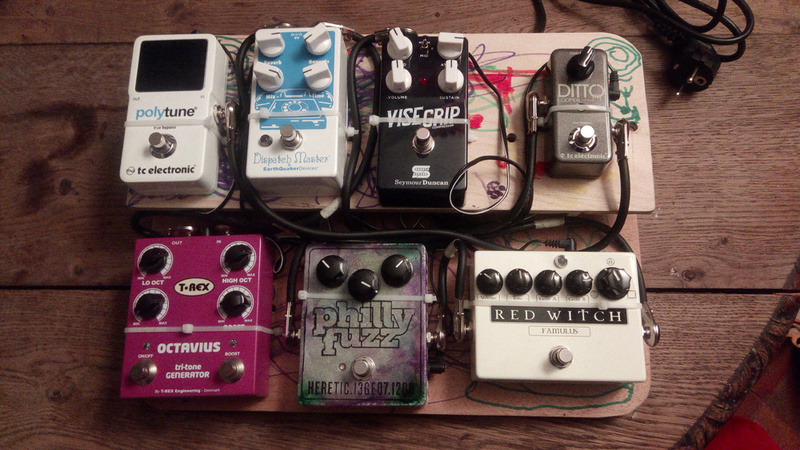 Today’s Pedal Line Friday submission is from David Clabaut. If you have a pedal line (doesn’t have to be in a board) for your rig, please email me a photo, bio, description of pedals and routing to pedalline@nulleffectsbay.com. Every Friday I’ll showcase a pedal line submission. Make sure you include any links to your band or music page. Board is home made. Just a couple of plywood (the top one is made of a cruiser).. sanded, cut, and assembled. Patch cables are homemade too. I’ve just recycled an old Cordial cable, which had an awful cut, and soldered pancake plugs. Compressor + Famulus > Well. pretty standard there. Comp is mostly for the sustain, with a low attack. Drive has two circuits, one is dirty, the other one is cleaner, and both are mixed. I’ve set it to have a clean open and low cranky end, slightly dirty but not so as the fuzz. Compressor + Heretic Fuzz + Octavius > Dedicated to fat sound. The fuzz is set mainly to have a big attack, with a high gain grain. I really love what John and Steve did with this one, which is a killer germanium fuzz. The octave (mostly down) gives more depth to it, and is mixed the dry signal. When soloing, I use the boost of the octavius, regardless of the configuration. Tuner at the end is used as a killswtich, to cut the entire line when needed.